FYI: I just released 4.0.19.Final. This changes the way ASYM_ENCRYPT disseminates the private shared group key to members, going from a pull- to a push-based approach  . In combination with JGRP-2293 , this should help a lot in environments like Kubernetes or Openshift where pods with JGroups nodes are started/stopped dynamically, and where encryption is required. The design is at . Check it out and let me know if you run into issues. Sorry for the short release cycle between 4.0.16 and 4.0.17, but there was an important feature in 4.0.17, which I wanted to release as soon as possible: JGRP-2293. This has better support for concurrent graceful leaves of multiple members (also coordinators), which is important in cloud environments, where pods are started and stopped dynamically by Kubernetes. Not having this enhancement would lead to members leaving gracefully, but that would sometimes not be recognized and failure detection would have to kick in to exclude those members and installing the correct views. This would slow down things, and the installing of new views would be goverened by the timeouts in the failure detection protocols (FD_ALL, FD_SOCK). On top of this, in some edge cases, MERGE3 would have to kick in and fix views, further slowing things down. Thanks to a contribution by Andrea Tarocchi, we can now inject arbitrary views into a JGroups cluster, generating split brain scenarios. (Note that '/' is used to separate node names; this is needed, because ',' is used to seperate arguments by default in probe) . The result is that node A is now its own singleton cluster (not seeing B and C), and B and C only see each other (but not A). Note that the member names are the logical names given to individual nodes. Once the split has been injected, MERGE3 should remedy it by merging A, B and C back into a single cluster, after between 10-30 seconds (in the above configuration). Thanks to Andrea for creating this nifty tool to experiment with cluster splits! I'm happy to announce that I've revamped the JGroups workshop and I'll be teaching 2 workshops in November: Rome Nov 7-10 and Berlin Nov 21-24. The new workshop is 4 days (TUE-FRI). I've updated the workshop to use the latest version of JGroups (4.0.x), removed a few sections and added sections on troubleshooting/diagnosis and handling of network partitions (split brain). Should be a fun and hands-on workshop! To register and for the table of contents, navigate to . To get the early-bird discount, use code EARLYBIRD. I'm happy to announce that I just released JGroups 4.0.4.Final! It's prominent feature is non-blocking flow control [1,2]. Flow control makes sure that a fast sender cannot overwhelm a slow receiver in the long run (short spikes are tolerated) by adjusting the send rate to the receive rate. This is done by giving each sender credits (number of bytes) that it is allowed to send until it has to block. A receiver sends new credits to the sender once it has processed a message. When no credits are available anymore, the sender blocks until it gets new credits from the receiver(s). This is done in UFC (unicast flow control) and MFC (multicast flow control). Flow control and TCP have been the only protocols that could block (UDP and TCP_NIO2 are non-blocking). Non-blocking flow control now adds protocols UFC_NB and MFC_NB. These can replace their blocking counterparts. Instead of blocking sender threads, the non-blocking flow control protocols queue messages when not enough credits are available to send them, allowing the sender threads to return immediately. When fresh credits are received, the queued messages will be sent. The queues are bound to prevent heap exhaustion; setting attribute max_queue_size (bytes) will queue messages up to max_queue_size bytes and then block subsequent attempts to queue until more space is available. Of course, setting max_queue_size to a large value will effectively make queues unbounded. Using MFC_NB / UFC_NB with a transport of UDP or TCP_NIO2, which also never block, provides a completely non-blocking stack, where sends never block a JChannel.send(Message). If RpcDispatcher is used, there are non-blocking methods to invoke (even synchronous) RPCs, ie. the ones which return a CompletableFuture. Other features of 4.0.4 include a new message bundler and a few bug fixes (e.g. the internal thread pool was not shut down). For the list of all JIRAs see . 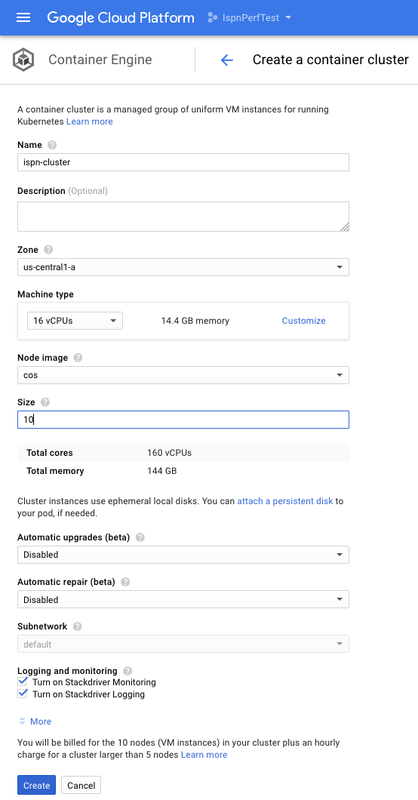 In this post, I'm going to show the steps needed to get a 10 node Infinispan cluster up and running on Google Container Engine (GKE). The test we'll be running is IspnPerfTest and the corresponding docker image is belaban/ispn_perf_test on dockerhub. Alternatively, the cluster could be run locally in minikube, but for this post I chose GKE instead. As shown, we'll use 10 v16-cpu instances with 14GB of memory each. If you logged into your Google Compute Engine console, it would show the 10 nodes that are getting created. This shows 1 infinispan instance (interactive terminal) and 3 ispn instances (non-interactive). This means we have view number 4 (0-3) and 4 cluster members (the number in parens). The infinispan pod and one of the ispn pods have been created on the same GCE node gke-ispn-cluster-default-pool-59ed0e14-5sn9. The reason is that they are different deployments, and so GKE deploys them in an unrelated manner. Had all pods been created in the same depoyment, Kubernetes would have assigned pods to nodes in a round-robin fashion. As suspected, instances infinispan-749052960-pl066-18029 and ispn-1255975377-6191p-15331 show lower performance than the other nodes, as they are co-located on the same GCE node. The Kubernetes integration in JGroups is done by KUBE_PING which interacts with the Kubernetes master (API server) to fetch the IP addresses of the pods that have been started by Kubernetes. The KUBE_PING protocol is new, so direct problems, issues, configuration questions etc to the JGroups mailing list. I'm happy to announce that JGroups 4.0.0.Final is out! With 120+ issues, the focus of this version is API changes, the switch to Java 8 and thus the use of new language features (streams, lambdas) and optimizations. Receiver (ReceiverAdapter) now has an additional callback receive(MessageBatch batch). This allows JGroups to pass an entire batch of messages to the application rather than passing them up one by one. Plus fixed security issues in the refactored code. Removed ENCRYPT. Message bundlers can be changed at runtime via probe. This is useful to see the effect of different bundlers on performance, even in the same test run. When we have multiple site masters, messages from the same member should always be handled by the same site master. This prevents reordering of messages at the receiver. Useful when running in an environment where the IP addresses and/or interfaces are not known before. Multiple threads can receive (and process) messages from a datagram socket, preventing queue buildups. E.g. removal of SingletonAddress: not needed anymore as shared transports have been removed, too. This massively reduces the number of Event creations. Instead of removing messages one-by-one, the remover thread now removes as many messages as are in the queue (contention) into a local queue (no contention) and then creates and sends message batches off of the local queue. There's only a single thread pool for all typs of messages, reducing the maintenance overhead of 4 thread pools and the configuration required. The internal thread pool is still available (size to the number of cores), but not configurable. A ForkJoinPool can be used instead of the thread pool (which can be disabled as well). If a task calls execute() with an argument blocking==false, the task will be executed by the timer's main thread, and not be passed on to the timer's thread pool. This reduces the number of threads needed and therefore the number of context switches. Ints and longs are read into a byte array first, then parsed. This was changed to read the values and add them to the resulting ints or longs. Should reduce overall memory allocation as ints and longs are used a lot in headers. This method is used a lot in NAKACK2 and UNICAST3. The change was to read messages directly into the resulting MessageBatch instead of a temp list and from there into the batch. Reduced size from 40 -> 32 bytes. This was done mainly for protocols where log.isTraceEnabled() was used a lot, such as TP, NAKACK2 or UNICAST3. Note that the log level can still be changed at runtime. This only applies only to regular (not OOB or internal) messages. Make sure that only one message per member is processed at a given time by the thread pool. This reduces the number of threads needed. Although indepent protocols, the protocol ID was assigned by the superclass, so replenish and credit messages would get mixed up, leading to stuttering in the sending of credits. This caused a bug in ASYM_ENCRYPT. The manual is at http://www.jgroups.org/manual4/index.html. Internal thread pool: used for JGroups internal messages only. The main raison d'etre for this pool was that internal messages such as heartbeats or credits should never get queued up behind other messages, and get processed immediately. Over time, I found out that - with most configurations - I had the queue in the regular thread pool disabled, as I wanted the pool to dynamically create new threads (up to max-threads) when required, and terminate them again after some idle time. Hence the idea to club regular and OOB thread pools into one. When I further thought about this, I realized that incoming messages could also be handled by a queue-less thread pool: by handling RejectedExecutionException thrown when the pool is full and simply spawning a new thread to process the internal message, so it wouldn't get dropped. The same goes for timer tasks: a timer task (e.g. a message retransmission task) cannot get dropped, or retransmission would cease. However, by using the same mechanism as for internal messages, namely spawning a new thread when the thread pool is full, this can be solved. Therefore, in 4.0 there's only a single thread pool handling regular, OOB and internal messages, plus timer tasks. The new thread pool has no queue, or else it would not throw a RejectedExecutionException when a task is added, but simply queue it, which is not what we want for internal messages or timer tasks. It also has a default rejection policy of "abort" which cannot be changed (only by substituting the thread pool with a custom pool). This dramatically reduces configuration complexity: from 4 to 1 pools, and the new thread pool only exposes min-threads, max-threads, idle-time and enabled as configuration options. I just released a first alpha of JGroups 4.0.0 to SourceForge and maven. There are 12+ issues left, and I expect a final release in October. The major version number was incremented because there are a lot of API changes and removal of deprecated classes/methods. I'd be happy to get feedback on the API; there's still time to make a few API changes until the final release. The shared transport was removed (https://issues.jboss.org/browse/JGRP-1844). Use fork channels instead. MuxRpcDispatcher was finally removed (https://issues.jboss.org/browse/JGRP-2008). YEAH!!! ENCRYPT was removed and replaced by SYM_ENCRYPT (keystore-based) and ASYM_ENCRYPT (asymmetric key exchange): https://issues.jboss.org/browse/JGRP-2021. ENCRYPT had a couple of security flaws, and since the code hasn't been touched for almost a decade, I took this chance and completely refactored it into the 2 protocols above. The code is now much more readable and maintainable. The performance of existing bundlers has been improved, and new bundlers (RingBufferBundler, NoBundler) have been added. Since the shared transport feature was removed, SingletonAddress used as key into a bundler's hashmap could also be removed. For instance, TransferQueueBundler now removes chunks of message from the queue, rather than one-by-one: https://issues.jboss.org/browse/JGRP-2076. Headers used to do a hashmap lookup to get their magic-id when getting marshalled. Now they carry the magic ID directly in the header. This saves a hashmap lookup per header (usually we have 3-4 headers per message): https://issues.jboss.org/browse/JGRP-2042. Header creation was getting the class using a lookup with the magic ID, and then creating an instance. This was replaced by each header class implementing a create() method, resulting in header creation getting from 300ns down to 25ns. The manual has not been changed yet, so browse the source code or javadocs for details. Enjoy! and feedback via the mailing list, please! FYI, 3.6.8.Final has been released. Not a big release; it contains mostly optimizations and a nice probe improvement. The main issues are listed below. - Proper discarding of messages from a different cluster with '-cluster' option. memory allocation pressure quite a bit. Used by RpcDispatcher. Fixed by eliminating the linear search done previously. Names like "A/web-cluster" would fail on Windows as the slash char ('/') was treated as demarcation char in some clouds. The manual is at http://www.jgroups.org/manual/index.html. The complete list of features and bug fixes can be found at http://jira.jboss.com/jira/browse/JGRP. When using remote procedure calls (RPCs) across a cluster using RpcDispatcher, it would be interesting to know how many RPCs of which type (unicast, multicast, anycast) are invoked by whom to whom. I added this feature in 3.6.8-SNAPSHOT . The documentation is here: . probe.sh rpcs-enable-details (and disabled with rpcs-disable-details). From now on, invocation times of synchronous (blocking) RPCs will be recorded (async RPCs will be ignored). This shows the stats for each member in a given cluster, e.g. number of unicast, multicast and anycast RPCs, per target destination, plus min/max and average invocation times for sync RPCs per target as well. I'm happy to announce another JGroups workshop in Munich April 4-8 2016 ! The registration is now open at . The agenda is at  and includes an overview of the basic API, building blocks, advanced topics and an in-depth look at the most frequently used protocols, plus some admin (debugging, tracing,diagnosis) stuff. We'll be doing some hands-on demos, looking at code and I'm always trying to make the workshops as hands-on as possible. I'll be teaching the workshop myself, and I'm looking forward to meeting some of you and having beers in Munich downtown! For attendee feedback on courses last year check out . Note that the exact location in Munich has not yet been picked, I'll update the registration and send out an email to already registered attendees once this is the case (by the end of January the latest). The course has a min limit of 5 and a max limit of 15 attendees. I'm planning to do another course in Boston or New York in the fall of 2016, but plans have not yet finalized. Cheers, and I hope to see many of you in Munich! I'm happy to announce that 3.6.7.Final has been released! This release contains a few bug fixes, but is mainly about optimizations reducing memory consumption and allocation rates. The other optimization was in TCP_NIO2, which is now as fast as TCP. It is slated to become the successor to TCP, as it uses fewer threads and since it's built on NIO, should be much more scalable. 3.6.7.Final can be downloaded from SourceForge  or used via maven (groupId=org.jgroups / artifactId=jgroups, version=3.6.7.Final). Below is a list of the major issues resolved. This allows nodes that have TCP as transport to talk to nodes that have TCP_NIO2 as transport, and vice versa. On a message reception, the transport would create a new buffer in TCP and TCP_NIO2 (not in UDP), read the message into that buffer and then pass it to the one of thread pools, copying single messages (not batches). This was changed to reusing the same buffers in UDP, TCP and TCP_NIO2, by reading the network data into one of those buffers, de-serializing the message (or message batch) and then passing it to one of the thread pools. The effect is a much lower memory allocation rate. When sending messages, a new buffer would be created for marshalling for every message (or message bundle). This was changed to reuse the same buffer for all messages or message bundles. The effect is a smaller memory allocation rate on the send path. If a message sent by TCP_NIO2 cannot be put entirely into the network buffer of the OS, then the remainder of that message is copied. This is needed to implement reusing of send buffers, see JGRP-1989 above. This transport used to have a single selector, processing both writes and reads in the same thread. Writes are not expensive, but reads can be, as de-serialization adds up. We now have a reader thread for every NioConnection which processes reads (using work stealing) separate from the selector thread. When idle for some time, the reader thread terminates and a new thread is created on subsequent data available to be read. UPerf (4 nodes) showed a perf increase from 15'000 msgs/sec/node to 24'000. TCP_NIO2's speed is now roughly the same as TCP. A Message had a Headers instance which had an array for header IDs and another one for the actual headers. These 2 arrays were collapsed into a single array and Headers is not a separate class anymore, but the array is managed directly inside Message. This reduces the memory needed for a message by ca 22 bytes! The request-id was carried in both the Request (UnicastRequest or MulticastRequest) and the header, which is duplicate and a waste. Removed from Request and also removed rsp_expected from the header, total savings ca. 9 bytes per RPC. This caused some issues in MacOS based systems: when the routing table was not setup correctly, multicasting would not work (nodes wouldn't find each other). Also, on Windows, IPv6 wouldn't work: https://github.com/belaban/JGroups/wiki/FAQ. The default was 3 (changed to 4 now) and if we had more headers, then the headers array needed to be resized (unneeded memory allocation). When the threshold of the send queue was exceeded, the bundler thread would send messages one-by-one, leading to bad performance. But bugs affect TCP_NIO2 only, and no other protocols. Enjoy (and find more bugs in TCP_NIO2) ! I'm happy to announce that 3.6.5 has been released ! The major feature of 3.6.5 is certainly support for non-blocking TCP, based on NIO.2. While I don't usually add features to a patch release, I didn't want to create a 3.7.0, and I wanted users to be able to still use Java 7, and not require 8 in order to use the NIO stuff. This new transport is based on NIO.2 and non-blocking, ie. no reads or writes will ever block. The biggest advantage compared to TCP is that we moved from the 1-thread-per-connection model to the 1-selector-for-all-connections model. This means that we use 1 thread for N connections in TCP_NIO2, while TCP used N threads. To use this, new classes TcpClient / NioClient and TcpServer / NioServer have been created. Fork channels used to throw an exception on calling ForkChannel.getState(). This is now supported; details in the JIRA issue. GossipRouter can now use a blocking (TcpServer) or a non-blocking (NioServer) implementation. On the client side, RouterStub (TUNNEL and TCPGOSSIP) can do the same, using TcpClient or NioClient. Which implementation is used is governed by the -nio flag when starting the router, or in the configuration of TUNNEL / TCPGOSSIP (use_nio). Blocking clients can interact with a non-blocking GossipRouter, and vice versa. Retransmissions use the internal flag: when a retransmission is a request, a potential response was also flagged as internal. This flag is now cleared on reception of a request. Caused by a conversion from nanos to millis. Was not the case as we used a HashSet which reordered elements. Request/response format has changed from application/xml to application/json in the Identity API. I'm happy to announce a new transport based on NIO.2: TCP_NIO2 ! The new transport is completely non-blocking, so - contrary to TCP - never blocks on a socket connect, read or write. The big advantage of TCP_NIO2 over TCP is that it doesn't need to create one reader thread per connection (and possibly a writer thread as well, if send queues are enabled). With a cluster of 1000 nodes, in TCP every node would have 999 reader threads and 999 connections. While we still have 999 TCP connections open (max), in TCP_NIO2 we only have a single selector thread servicing all connections. When data is available to be read, we read as much data as we can without blocking, and then pass the read message(s) off to the regular or OOB thread pools for processing. This makes TCP_NIO2 a more scalable and non-blocking alternative to TCP. So TCP_NIO2 was better in both cases, which surprised me a bit as there have been reports claiming that the BIO approach was faster. I therefore recommend run the tests in your own environment, with your own application, to get numbers that are meaningful in your system. The documentation is here: . I'm happy to announce the first usable release of jgroups-raft  ! The full list is at . For questions, feedback etc use the mailing list . I'm happy to announce that we're offering 2 JGroups trainings in the US: in New York and Mountain View in Sept 2015 ! To get more info and to register visit http://www.jgroups.org/workshops.html. Registration is now open. The class size is limited to 20 each. Hope to see someof you at a workshop this year ! I'm happy to announce a JGroups workshop in Berlin June 1-5 2015 ! This is the second in a series of 4 workshops I'll teach this year; 2 in Europe and 2 in the US (NYC and Mountain View, more on the US workshops to be announced here soon). Registration  is now open (15 tickets only because I want to have a max of 20 attendees - 5 already registered). There's an early bird registration rate (500 EUR off) valid until April 10. Use code JGRP2015 to get the early bird. The recommended hotel is nhow Berlin . Workshop attendees will get a special rate; check here again in a few days (end of March the latest) on how to book a room at a discounted rate. Hope to see some of you in Berlin in June !